BY GEORGE! Wigan get back on track thanks to hat-trick hero Williams... but Adrian Lam won't let himself think about 2020 as the Shaun Edwards saga takes more twists. Catch up with all the weekend's action - including a narrow win for Hull in London, another defeat for last-placed Leeds, impressive displays from Saints and Huddersfield and a scare for Warrington as they keep up the pace. 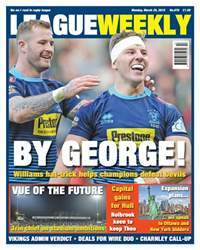 Off the pitch, we bring news of new deals for two Warrington stars (and an England call-up for another) but can Saints keep Theo Fages out of the clutches of the NRL? Meanwhile, Salford are set to recruit after an injury to Ken Sio and Castleford target a centre ... could it be a certain high-profile Championship star? Widnes' administrators are set to deliver their verdict in full - but we reveal what O'Haras say about 'financial impropriety' ... or a lack of it. And what of Wakefield's plans to renovate Belle Vue? We catch up with chairman John Minards.